The Lechuza Puro 20 All In One Self Watering Tabletop Planter features a surface that is robust, yet soft to the touch, this new planter’s spherical shape brings out the beauty in plants both indoors and out. A picture-perfect accent for your orchids, small houseplants and herbs. A removable liner makes planting and maintenance easy and tidy. This all-in-one planter includes a specially formulated granular material, called Lechuza PON, that's made from nutrient-enriched pumice, zeolites and lava. The clean, attractive material wicks water up from the built-in reservoir, aerates the roots and provides your plant with nutrition. A layer of Lechuza PON spread over the reservoir wicks water to the potting mix around your plant’s roots. 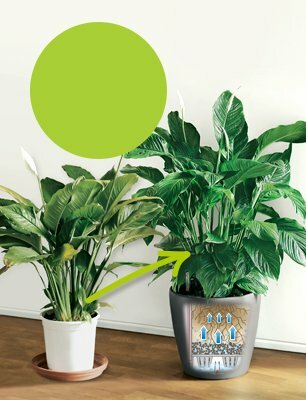 The water reservoir releases moisture as your plants need it and lets you water less often. The stylish outer pot is watertight so you can place it directly on furniture without worrying about leaks. Inside, a matching liner easily lifts out, making it easy to change plants, repot, trim roots and rinse leaves. How Do I Pot My Plants in the LECHUZA System? All LECHUZA planters arrive as an all-in-one-set. Depending on the model, each set includes your LECHUZA planter, the LECHUZA planter liner and the sub-irrigation system (including the appropriate amount of PON). The only thing you need to complete the potting process is soil or additional PON (Table planters are the exception: each includes enough PON to plant entirely with the PON and without any soil). Pour the included LECHUZA-PON substrate on the separator inside the planter. This is important because it will later allow the plant to supply itself with the optimum amount of water from the planter's reservoir. Then, just add some soil or planting substrate LECHUZA PON, place the plant in the planter, and fill it up with soil or PON. 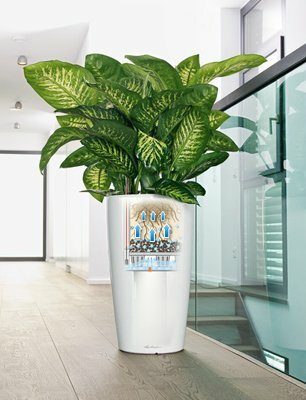 How Do I Water and Nurture My Plants in a LECHUZA Pot? After planting in the Lechuza, continue to water your plant for 12 weeks as you usually would. Water the plants onto the top of soil during the first weeks, until the roots have grown into the water reservoir ("growing-in phase"). During this time, you can check the soil or the LECHUZA-PON substrate just below the surface to see if it's still moist. If it's dry, you can water the plant. 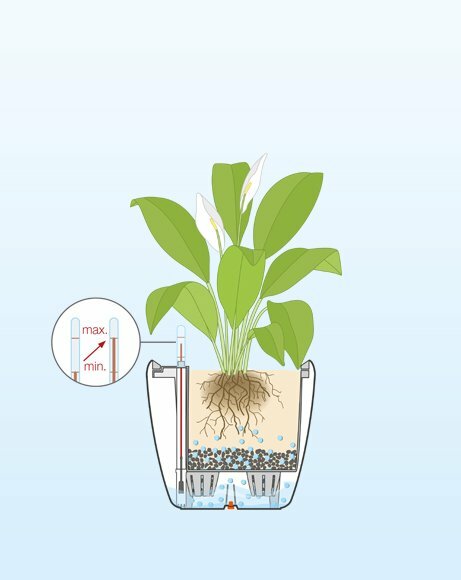 Test: After a few weeks, you can test to see whether the roots of the plant have already grown down into the moisture area by filling the water reservoir halfway. If the water level indicator goes down in the next few days, the roots have grown into the reservoir. Fill the water reservoir up to "max. ", LECHUZA now takes care of your plants. If not, this specific plant will need a slightly longer growing-in phase (e.g. orchids, or plants that start with a very small root ball, etc.). Once the level indicator shows, "min." it is not necessary to water your plant immediately. The substrate is still moist enough to provide water to the plant. Be careful: Stick to the "dry phase"! It is different with every plant and depends on the following factors: The species and variety of plant, position of the planter, need for air humidity and water, temperature conditions, and substrate requirements. We recommend a dry phase of 2 - 10 days, except with plants like cacti, we suggest a little longer. 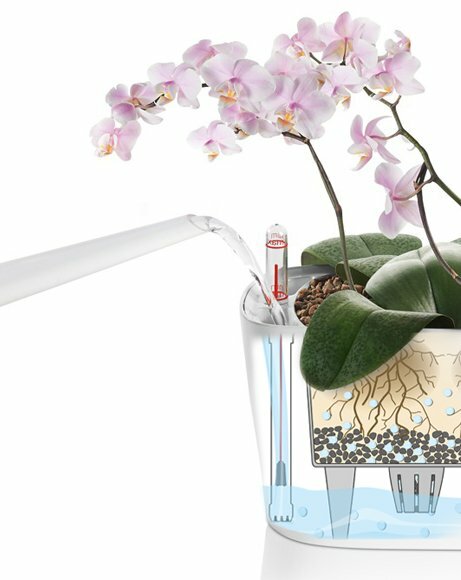 Inspired by nature: The LECHUZA sub-irrigation system ensures that your plants receive the exact amount of water they need for optimal growth. Time to relax: Thanks to the LECHUZA-water reservoir, your plant is perfectly taken care of - no more daily watering! Simply fill the water reservoir via the water supply shaft. 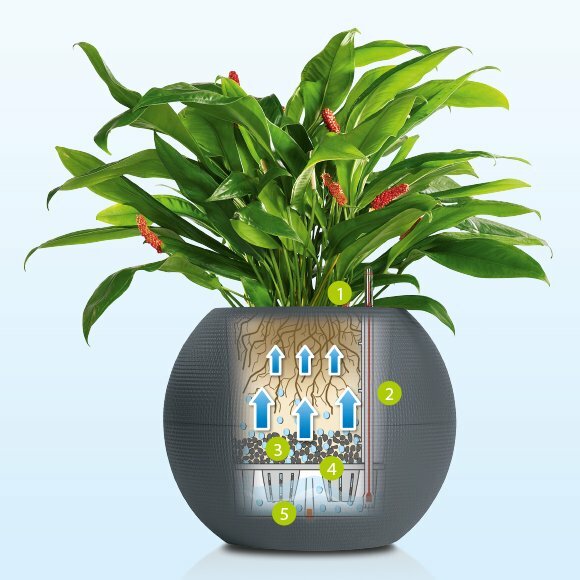 In a LECHUZA planter, your plant supplies itself through the water reservoir with the optimal amount of water it needs for healthy growth. 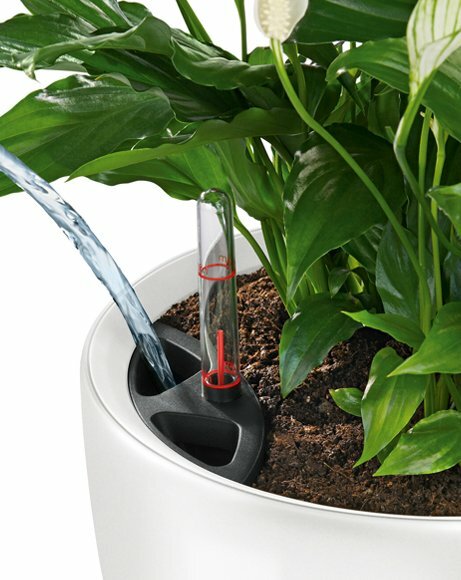 30% better plant growth thanks to a balanced water supply!